thank you so much to everyone who said such nice things about my tablecoth shirt here and on flickr, it's been such a nice treat! i have another shirt and a simple shift dress cut-out, waiting to sew but i got sidetracked with the thought of making new pillowcovers for the couch cushions and, well, you know, just had to start on them instead. here are the covers so far - ithe plan is a patchwork centre with solid colour border and patterned back (fabrics to be decided) with 2 button closure. it's my first real exercise in patchwork and i'm a little disappointed with how the squares lined up in the end. something to work on for next time, i guess. i'm still pretty happy with the colours and the fabrics though, hopefully i can get these wrapped up this week and then get back to the clothes! The colours look great, can't wait to see the end result. Very lovely quilt, nice colors and patterns. 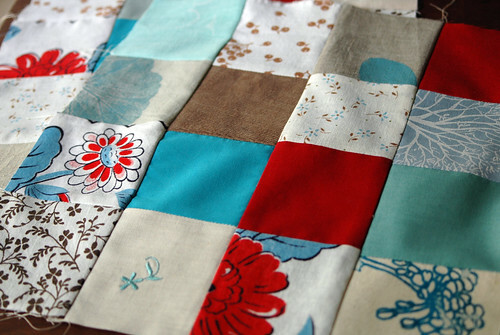 I know from working with patchwork how difficult it can be to line up squares. nice! great colours! I can imagine it'd be sooo hard to get the squares lined up perfectly. Even if you cut them perfectly and tried to stitch them perfectly, there's always room for little shifts. Maybe there's a tutorial somewhere on the net about it! Hey I always knew you were busy and clever and crafty and now I know that I was only half way there. What great things you can do. Prue just finished a patch work course and I am sure she would love to chat about it.